You’ll trigger this series of quests - if you can call them that - by saving Mama Murphy and the other settlers from the Museum of Freedom in Concord. Once they’ve resettled in Sanctuary, speak to Mama Murphy. This will start a line of requests that will appear under the Miscellaneous quest category. Jet. Perhaps the most common drug. Appears as an inhaler. Common in Raider dens if you look on desks and in boxes. Mentats. A little rarer. Appears as a small, cassette-shaped box. Again, common enough in Raider dens; I found it fairly often on shelves. Med-X. About as common as Mentats. Appears as a syringe. I most often found Med-X in medical kits and cabinets, but not always. Psycho. Probably the rarest of the five drugs she’ll request. Appears as a bulkier form of syringe. Boxes, fireside, doesn’t seem to appear anywhere more often than anywhere else. Giving Mama Murphy chems will displease any companions in your current settlement. If you don’t want to piss them off, send them somewhere else before doping up Mama Murphy. After the first serving of drugs (Jet) you’ll also be asked to craft Mama Murphy’s Chair. You can create this item with four Wood, three Cloth, and one Steel. It’s all easy, common stuff that you can find in abundance throughout Sanctuary. Whenever you ask Mama Murphy to make a prediction she’ll retreat to this chair for several hours, and you won’t be able to get another prediction until she rests. Go sleep for seven, maybe eight hours, then try her again. 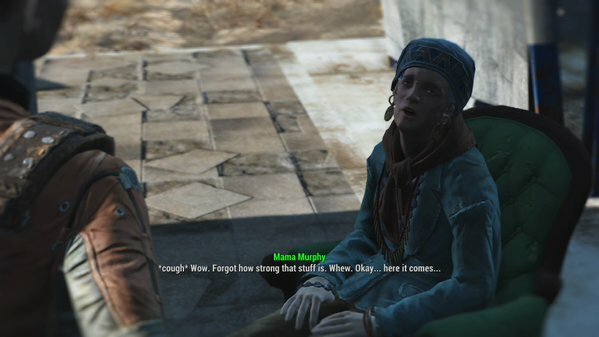 Whenever you speak to Mama Murphy you also have the option to persuade her that she’s an addict and needs to stop using chems. This requires a high Charisma check, and if you fail on one of the two possible checks (threaten or persuade) you’ll have to wait for a while before trying again. If you’re successful she’ll stop giving out hints. If you fail and keep giving her drugs she will out and out die after her Psycho trip, and you’ll lose one of your settlers in Sanctuary. Everyone there will also get really bummed out.